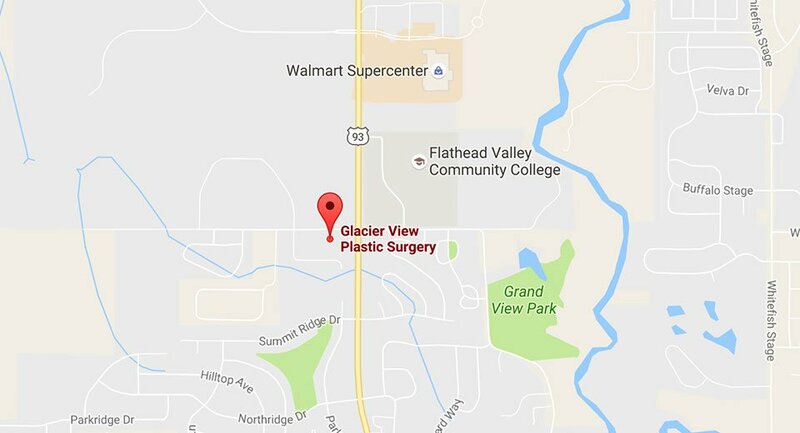 Patients travel to our plastic surgery practice in Kalispell, from places like Missoula, Helena, Bozeman and even outside Montana. People come from as far as Canada and Alaska, as well as the East Coast, and they have a couple of options if they plan to travel by air. Our staff can provide detailed information about the local area for patients coming from outside Montana and recommend lodging and dining options in Kalispell, Whitefish, and other nearby areas. If you’re interested in learning more about a procedure or need more information about traveling to our practice, give us a call at (406) 756-2241 to discuss your plans with one of our staff members. You can also request a consultation to meet with one of our surgeons in person. Glacier Park International Airport: This airport is less than 10 miles from our practice and is served by 4 major airlines (Alaska, Allegiant, Delta, and United). There are rental cars available at the terminal, in addition to taxi and shuttle services. Missoula International Airport: Many of our plastic surgery patients fly to Missoula, which is about a 2-hour drive from Kalispell via U.S. 93. The route offers spectacular scenery. Frontier Airlines and the 4 airlines that serve Glacier Park International Airport fly into Missoula. To inquire about extended stay rates, please call the Sales Office at (406) 407-7128. Van transportation to and from the airport, and within a 5 mile radius of our hotel to include (but not limited to): Glacier View Plastic Surgery, down town, shopping area, and local restaurants is complimentary and available 24 hours a day. to/from airport and AMTRAK; spa and fitness center; outdoor seasonal pool; hot tubs; morning coffee café. Indoor pool; two Jacuzzis; sauna; restaurant; lounge; cable TV; gift shop; laundry facilities; golf course; cross country skiing. This intimate European-style lodge provides lodging at Whitefish Mountain Resort near Whitefish, Montana with an elegant lobby, 50 luxurious hotel rooms and suites and a gourmet restaurant with an extensive wine list. Kandahar Lodge is not just another Whitefish hotel. Enjoy the comfort and convenience of being located slopeside in the winter and off the beaten track yet within an hour’s drive of Glacier National Park in the summer. Whitefish Mountain Resort is a ski resort located at The Big Mountain in northwestern Montana, located west of Glacier National Park in the Flathead National Forest. There is great powder skiing in the winter and many fun summer activities as well. It is 4 miles from the town of Whitefish and 21 miles north of the city of Kalispell. Glacier National Park is a national park located in the U.S. state of Montana, on the Canada–United States border with the Canadian provinces of Alberta and British Columbia. The park encompasses over 1 million acres and includes parts of two mountain ranges, over 130 named lakes, more than 1,000 different species of plants, and hundreds of species of animals. This vast pristine ecosystem is the centerpiece of what has been referred to as the “Crown of the Continent Ecosystem”, a region of protected land encompassing 16,000 square miles.